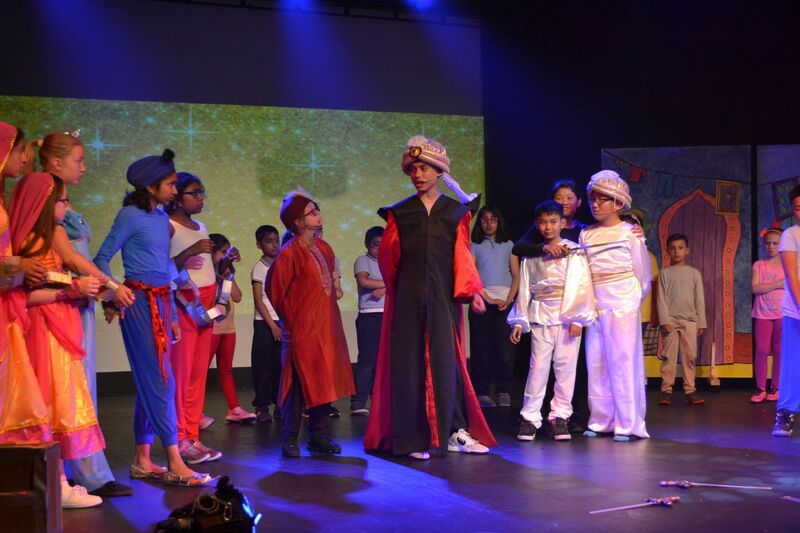 Am-Dram in Dublin – Aladdin Junior at Liberty Hall – Interview by A.D.
June 27th saw the curtain go up on a new venture for the pupils of St Mary’s Primary School, Dorset St, as they staged their production of Aladdin Junior in the Liberty Hall Theatre. St Mary’s have featured several times on RTE’s News2Day for their celebrations of the many nationalities represented at the school. Over 30 languages are spoken by the children and their families, showing just how diverse the school is and how many from all over the world call St. Mary’s their place. For some time now, each year, the children stage a show, usually in the school hall. Tickets go fast, in recent years needing two performances to accommodate all the family, friends and community keen to see the children shine on stage. How did you decide on Aladdin? Éadaoin: The children in our school come from all over the world. We were looking for something engaging and fun that would reflect the cultural diversity of our community. Every child from 2nd to 6th Class (over 120 children) were in the show and were on stage. The children have also been involved in set design, prop making and stage management. When did you start rehearsal? We started learning the music together at the end of April. Classes paired up to learn one of the big dances each and children with parts worked with teachers after-school to rehearse different scenes. Is there a big team involved in the production? It is a huge team effort. Every member of staff has contributed to the production, from leading rehearsals in singing, acting or dancing, to designing sets and props, sourcing costumes, selling tickets, coordinating sound and lights, helping backstage and much more. Describe the atmosphere in school in lead up to show. The atmosphere at school was electric! The air was buzzing with anticipation and we were all very excited to see the show come together. Are many children involved in Drama activities outside school? Most of our children don’t have the opportunity to engage in drama activities outside of school. For many families, this will be their first time in a theatre. It is fantastic to be able to offer that first opportunity. St Mary’s Aladdin Junior played for one night only, June 27th, Liberty Hall.